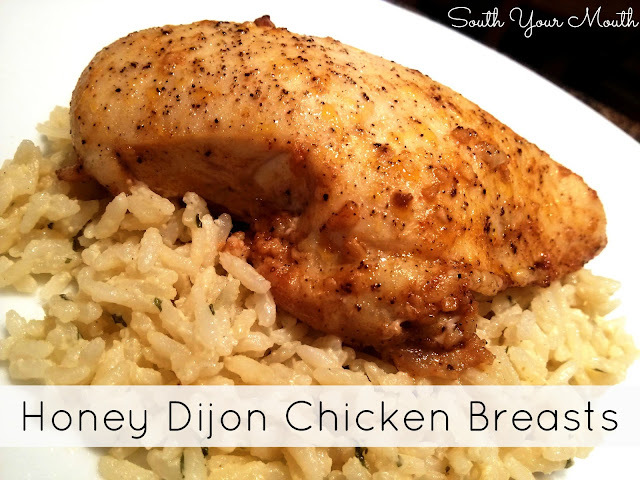 Quick and easy baked chicken with honey and Dijon mustard. Oh my Lord, I get stumped at suppertime some nights. Most weeknight evenings I've only got about one hour to get everything done before the onions’ bedtime so my options are somewhat limited. The problem we Southerners face with weeknight meals is that our best dishes are usually cooked low and slow. Give me a Saturday with nothing to do and I could shut down Bobby Flay but quick cooking isn't my forte. Anywho… I’m standing in the kitchen last week looking at a pack of chicken breasts wishing I had a box of Shake n’ Bake somewhere because I was suddenly overcome with a streak of lazy the size of a school bus. I was considering just feeding everyone cereal for supper and calling it a day. But sitting down at the table and eating a hot meal together is just hard-wired into my DNA so I decided the second easiest thing to cereal would just be to season that chicken up and throw it in the oven. Which is what I did. I was a little worried the chicken would be underwhelming so I served it with tiny cups of honey for dipping. My little beggars cleaned their plates! Brutus, who I practically have to hog-tie to get to eat his meat, was the first to finish! So, this is easy and my onions love it? Oh yeah, this is going into the weeknight rotation. Fo sho. Spray a 13x9 baking dish with cooking spray, add chicken and cover tightly with aluminum foil. Bake at 375 degrees for 15 minutes. Remove aluminum foil and continue cooking for approximately 15 more minutes or until chicken is done. Serve with a small cup of honey for dipping or drizzle cooked chicken with a little more honey. Trying this with chicken legs and breasts...smells yummy! So good! I tried this tonight and the chicken was so very tender and not dry at all!! I tried this recipe last night. One word--WINNER!! Not usually a big fan of honey mustard, but this ain't my mama's honey mustard! LOL...Great recipe--easy, fast and fun (I love getting my hands dirty when I cook!) This one goes in the rotation!! Thanks!! YES!! I made the rotation!!! Glad y'all liked it!! I just realized I never answered you! It was one of those box mixes... parmesan something or other?